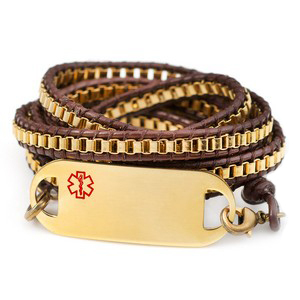 Medical ID bracelet with gold plated stainless steel plaque. The bracelet wraps around the arm multiple times, fitting a variety of wrist sizes and capable of being worn in a range of comfortably snug to casually loose styles. The bracelet is made of gold plated chain beads, leather, and gold plated stainless steel lobster clasps. Displays a medical alert symbol on a plaque which may be engraved on front and/or back. Plaque measures approximately 1 5/8 x 5/8 inch and attaches to the bracelet with the clasps. Love my new bracelet, fast shipping, and have received several compliments.